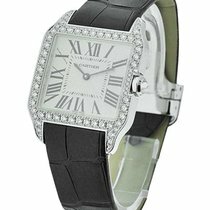 18kt white gold case with a black leather strap. Fixed 18kt white gold diamond set bezel. Silver dial with black hands and Roman numeral hour markers. Minute markers around an inner ring. Dial Type: Analog. Cartier Calibre 690 quartz movement. Scratch resistant sapphire crystal. White gold octagonal set with a diamond crown. Solid case back. Square case shape, case size: 38.5 mm x 30.3 mm, case thickness: 5.38 mm. Deployment with push button release clasp. Water resistant at 30 meters / 100 feet. Functions: hour, minute. Additional Info: bezel and lugs set with 62 diamonds.